Sorry for the delay, forum wasn't loading right the other day. What was the small icon, exactly? Anyway, that was a far cuter reaction to an apocalyptic event than I ever would have imagined. Lavinius wrote: What was the small icon, exactly? Oh, sorry, guess I didn't detail that well, it's your basic comms icon "Sound Only" type thing. Alright so these next posts should see your characters to bed, then chapter two will start. Though she is, of course, named after this. Also here is the Evangelion Making Thing I used to make her. Last edited by Lavinius on Thu May 23, 2013 3:50 pm, edited 1 time in total. Will update soon, probably tonight. Also, how do you save images from the Eva-maker? Squigsquasher wrote: Also, how do you save images from the Eva-maker? There isn't a built-in way. Print screen, paste into Paint, crop, then save. Note that these aren't exactly as I intend them to look, these are the closest possible representations I could do with the programme. It's a nifty little thing though, great fun to muck around with. Sorry for the delay. Had homework to do yesterday. Also I will be out of town next weekend 24th-27th. Just giving you guys a heads up! Spirit: Once housed the saved soul of a scientist killed in Second Impact; Evelyn quietly killed it for it was inelegant and unnecessary, her being able to pilot without it. Design: Primarily black in color, ornamented with golden trim, with occasional dark redish purple. It wears a golden mask like Evelyn's own face. On its head is a tall slender pyramid. Ornate and mystic, with a southeastern Asian aesthetic. Fitted with the prototype of wings for the Evangelions. Purpose: Originally the only Evangelion to be built, prior to the realization of the necessity of a translator, L'Evangelion Vera is of course the most sacred in Seele's views. Intended to be the main source of energy for the Human Instrumentalty Project. Currently it guards the site of Second Impact in Antarctica, defending Adam's remains should an Angel seek completion there. Wields the Lance of Longinus. Last edited by Lavinius on Sun Jun 09, 2013 5:07 pm, edited 5 times in total. I'm just gonna skip this round, I want to post, but I'm just so fried and I don't wanna hold everyone up, so just go with Ro having headed home quietly. 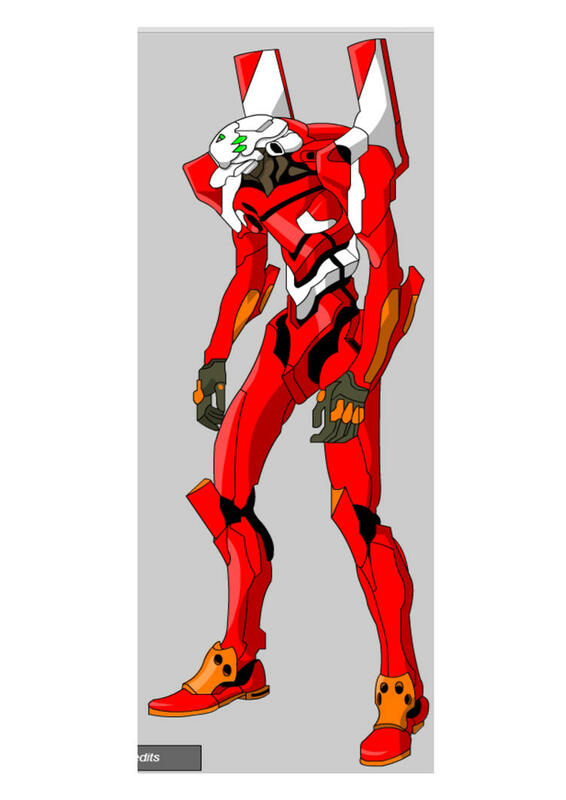 Evangelion Making Thing-made version of Evangelion Unit-00. Obviously much farther from the true idea than the version of Ophelia, who was pretty much spot-on. At Aggy-kun's disgression I have slightly modified my post. Ok guys. I will be making a post tonight once I get home. Have about a three hour drive from my buddys naval base. Alright, so because of some confusion I would like to remind everyone of the posting order. If, after three days, you have not posted, I will PM you a reminder. Last edited by Lavinius on Sat Jun 22, 2013 2:11 pm, edited 1 time in total. Gonna post tomorrow, hopefully. Need to get some shut-eye. Hehe liked your post Squig! I'll have mine up sometime this evening hopefully. When in my first post I had Frederik describing her as "beautiful, but not at all lovely," I didn't so much mean that he thought she looked like a man so much as that he thought she had not-attractive features, but still was aesthetically pleasing in a non-human way. It's a hard concept to explain... I met a girl like that once. But all of that is up to Lance-san anyway. Heh, Qiuyi has some funny tastes...Besides, I was going off the image of her I had in my mind's eye, and I imagine her as a slightly androgynous looking, but still attractive, very slender and elegant girl (well, boy technically, but I'm being respectful). We'll have to see what Lance's thoughts are. I never imagined Ro as all that beautiful. Cute in a nervous sort of way, but not overly attractive by either gender standard. Would probably be more attractive if s/he learned to stop worrying and relax. Still, that's not to say I'm not flattered by the opinions. XD Suitors all round for "Miss" Aisling.